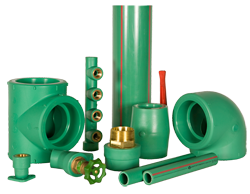 For Building Services Plastic Pipe you need look no further than WEFATHERM PP-R piping system. WEFATHERM Piping System provides excellent corrosion resistance and offers an ideal alternative to copper and steel tube giving up to 30% saving over copper. WEFATHERM Piping System is manufactured in Germany by Wefatherm GmbH to the highest international standards. With an extensive range of fittings and choice of pipe options that include: standard PP-R Pipe, Composite Fibre Pipe and Stabi-Compound Pipe, the WEFATHERM system offers an ideal solution for all plumbing applications. Plastic Pipe Systems Limited is pleased to work with AIG, a leading pipework fabricator and installer specialising in plastics in all industry sectors. AIG offers expertise in system design and offsite prefabrication. It is the UK’s leading of bespoke long-radius bends in PE and PP-R.
A bespoke pre-insulating service for Wefatherm PP-R pipe systems is available as the Hiline Rigid Polymer pipe system from our partner CPV Ltd . Plastic Pipe Systems Limited is proud to be associated with CPV, the leading pipework insulation specialist in the UK.